We are speeding towards February and that can only mean one thing – the Sustainable Skills and Education (SuSEd) series is nearly here! This year the theme is Soil and the World Beneath Our Feet. 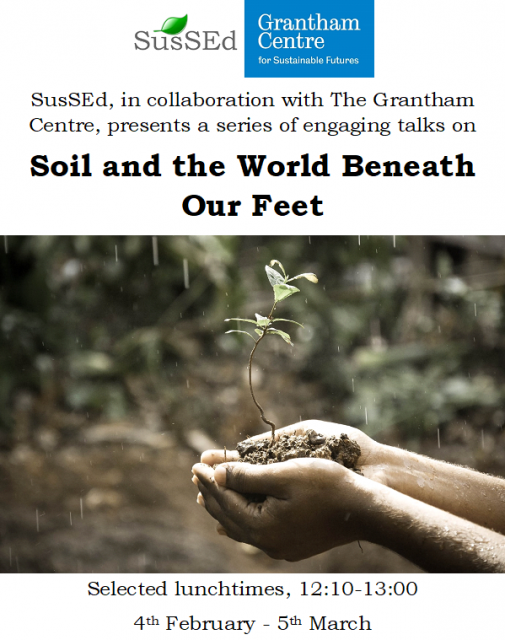 We will be exploring how soil forms the foundation of many aspects of our lives and how it is vital to a sustainable future. The talks will cover a broad range of topics from major policy decisions, to artificial soil in refugee camps, to cereal killers. The series is organised in collaboration with the Grantham Centre for Sustainable futures and the talks will be delivered by their researchers and PhD scholars. This is a fantastic opportunity to get an insight into their world leading research. The talks are free to attend and open to all University of Sheffield staff and students. Undergraduates will also get HEAR recognition for attending at 5 or more talks. Click here to see the full schedule and book your tickets!